An antique vanity mirror tray is a beautiful accent piece for any woman's boudoir. Whether you love the romantic elegance of the Victorian era or the sophisticated glamorous lines of the Art Deco style, there are antique and vintage mirrored vanity trays to compliment your style. These exquisite ladies' bedroom accessories include many beautiful styles ranging from beveled mirrors set upon ornate filigree feet and enclosed mirrors surrounded with highly detailed open weave or braided metalwork to etched mirrors delicately set in a bed of clear crystal and stunning ones of cobalt blue and chrome. 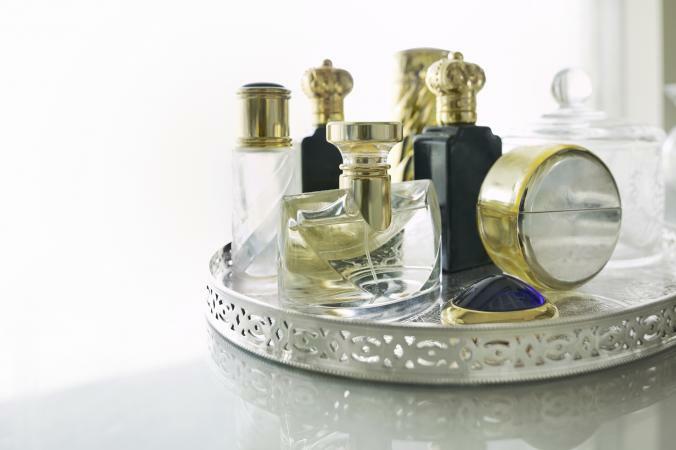 In the antique world the terms dresser tray, vanity tray and perfume tray are often used interchangeably. However, many people refer to a raised plateau as a vanity tray. Although these beautiful pieces were in fact used on a lady's vanity or dresser to display their elegant perfume bottles or other treasures, they are actually called mirrored plateaus. Mirrored plateaus were also commonly used in dining rooms to raise the table's decorative centerpiece. In today's homes mirrored vanity trays and plateaus often find themselves in rather unique positions. In addition to being used on dressers, vanities and dining room tables, they often are hung on walls as decorative accent pieces, stood on end on fireplace mantles often as a background for crystal candleholders and unique picture frames or holding a display of favorite collectibles on a living room shelf. Many times people use an antique or vintage mirrored tray to hold a display of lit candles. Although the look is beautiful, a word of caution is in order. Make certain that your candles do not burn completely down causing the bottom of their candle holders to get hot. Sadly, many beautiful mirrored or glass trays and plateaus have cracked from the heat which is often too high for the old glass and mirrors to withstand. This vintage vanity tray found at Ruby Lane, circa 1940s - 50s, features a beautiful metal banding encircling the mirror with a wall hanger on the back. This Art Deco plateau, circa 1930s, made by Ahna-Guo features an etched mirror and beautiful open weave white metal which is possibly nickel silver or pot metal. On and offline antique shops offer many styles of vanity trays in a variety of beautiful materials and designs including: . When you place your favorite bottle of perfume or a pearl necklace on your antique vanity mirror tray, for a brief moment you feel as if you traveled through time to many years ago.